Our second day on the road was full of stops along the beautiful Pacific Coast Highway (simply known as PCH to those in the know). Joining the coast at Morro Bay we headed northwards along CA 1, our first stop just short of San Simeon was to see the elephant seals on the beach. The weather wasn't brilliant, warm but cloudy, which was a shame as the coast would have looked even better bathed in sunshine. After that we stopped off at Julia Pfeiffer Burns State Park with its trail and view of McWay Falls, a lovely waterfall that crashes over the sheer cliff onto the beach below. Then on to Nepenthe for some lunch. Nepenthe, named from the Ancient Greek, 'that which chases away sorrow', is a fitting name for the clifftop restaurant with stunning views over the Pacific coastline. 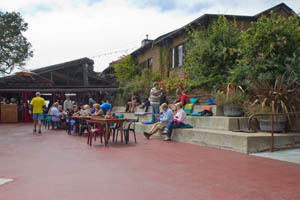 It has a real laid-back hippy feel to the place and as luck would have it, the sun started to break through the clouds whilst we were eating there. But this was short-lived and the cloud came in again as we crossed the Bixby Bridge and headed into Carmel. 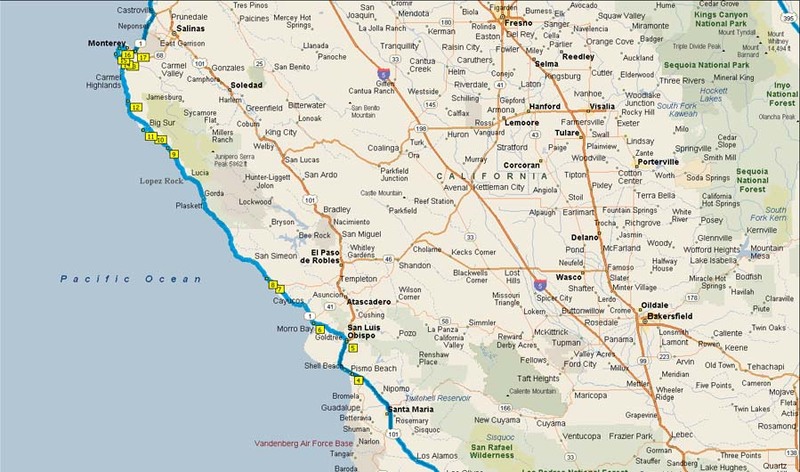 After a short stop here we picked up the 17 mile drive past Pebble Beach and around the peninsular into Monterey. Coming at the end of the day and with indifferent weather, we didn't feel wowed by 17 mile Drive. I'm sure given better weather and different circumstances it is a really pretty place, maybe one for a return visit another year. By the time we reached Monterey we didn't have the energy to go exploring and so just spent the night in the motel. Remember everything, forget nothing. For everything forgotten returns to the ever-circling winds.